Monday was our friend Mike Patton’s birthday, and we wanted to do something special. So we made a reservation, picked Mike and Harry up in Vallejo, and motored on up to Healdsburg, for an incredible, fantastic, borderline insane dinner at Cyrus. 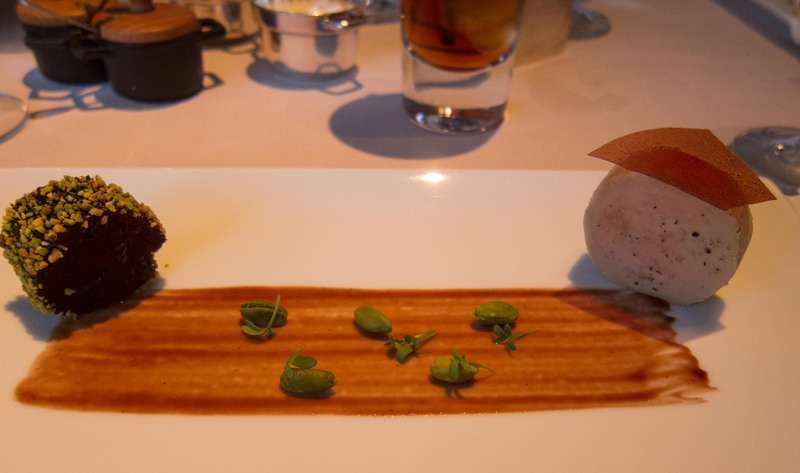 The Michelin Guide gives only one restaurant in the Bay Area three stars, The French Laundry. Cyrus gets two stars, along with Manresa, Boulevard, Meadowwood and a couple of others. If they asked me, Cyrus would get 3 stars, too. I’ve eaten at both, and there is simply no difference in quality, inventiveness, ingredients, service or ambiance. With light traffic, we arrived almost 30 minutes early for our reservation, but they seated us immediately. Cyrus isn’t large, seating perhaps 75 people in a plush, warm environment designed to put you at ease from the start. Carpets are thick, silver is heavy and solid, they keep the sound down so you can converse easily during the long dinner process. 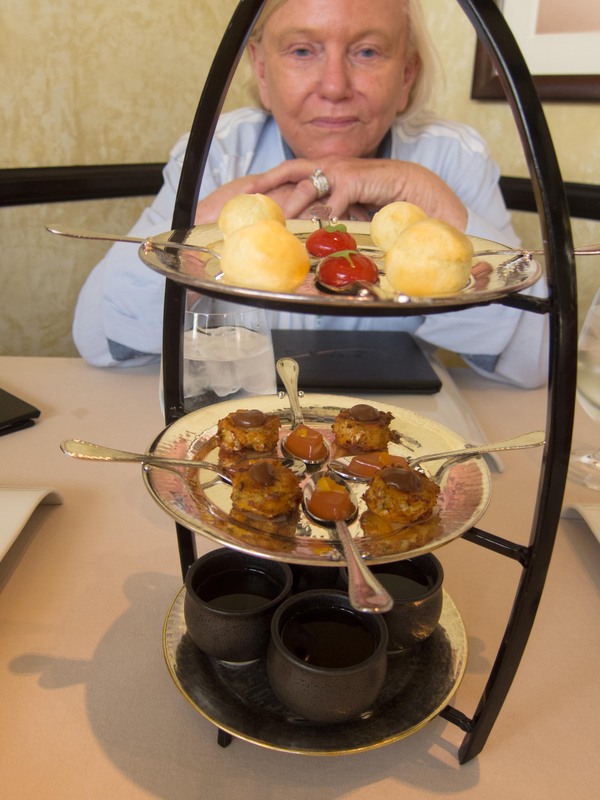 The meal begins with a tower of amuse bouches designed to wake up and sharpen your taste buds in all 5 of the flavor groups–sweet, sour, salty, bitter and umami. The small red item on the spoon in the photo below is the sweet, which is somehow magically encapsulated in such a way that it “pops” in your mouth, exploding with flavor. 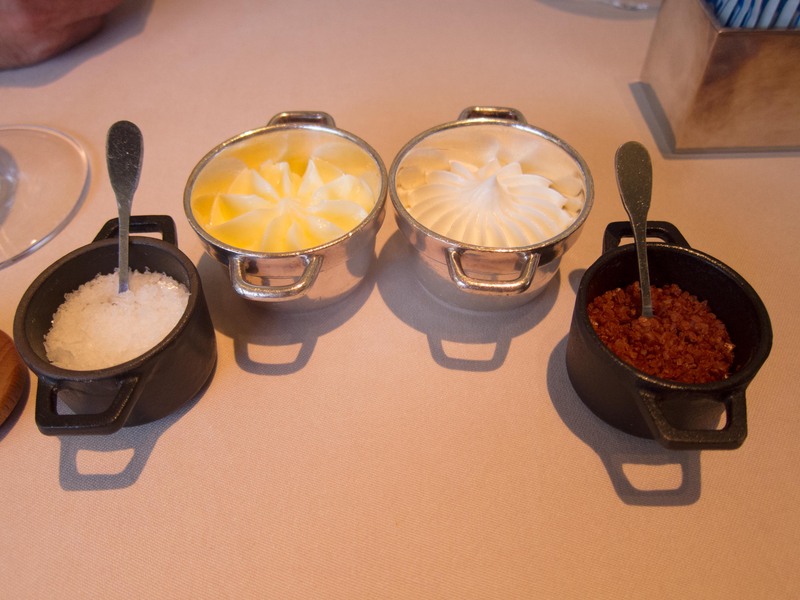 That sort of technical trickery is a hallmark of the molecular gastronomy movement, which (it seems to me) is often used to substitute kitchen technique for flavor, but not at Cyrus. They use the kitchen wizardry in the service of the food, sparingly, not just to have flash and glitter in their presentations. The tower of amuses, to sharpen all your taste buds. It being a special occasion, we then started with the caviar. Three 1/2 ounce portions of different types–they were all a rich, black osetra, but there were distinct differences in flavor. We all agreed that we liked the Israeli product the best. 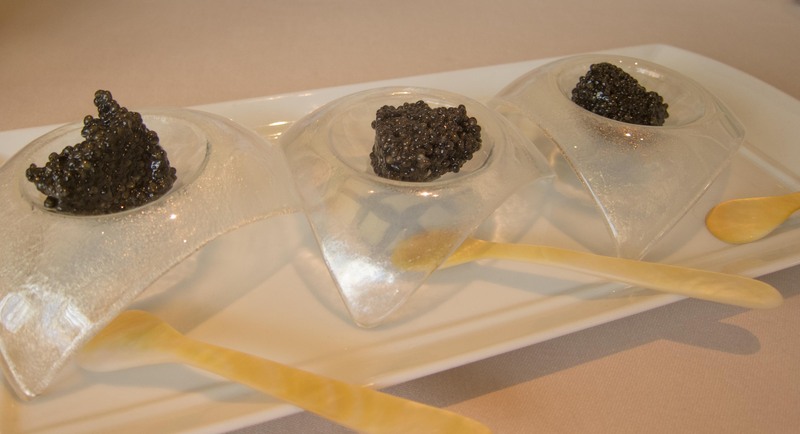 Three types of osetra caviar, served with mother of pearl spoons. 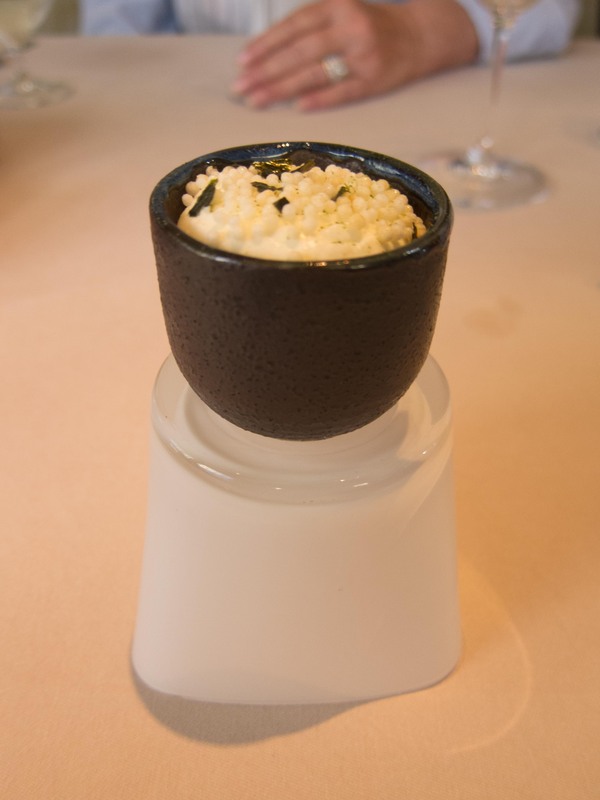 The caviar is accompanied by phenomenal small breads, and a plate containing creme fraiche which has been flash frozen to make it like a powder, which promptly thaws back into a cream. 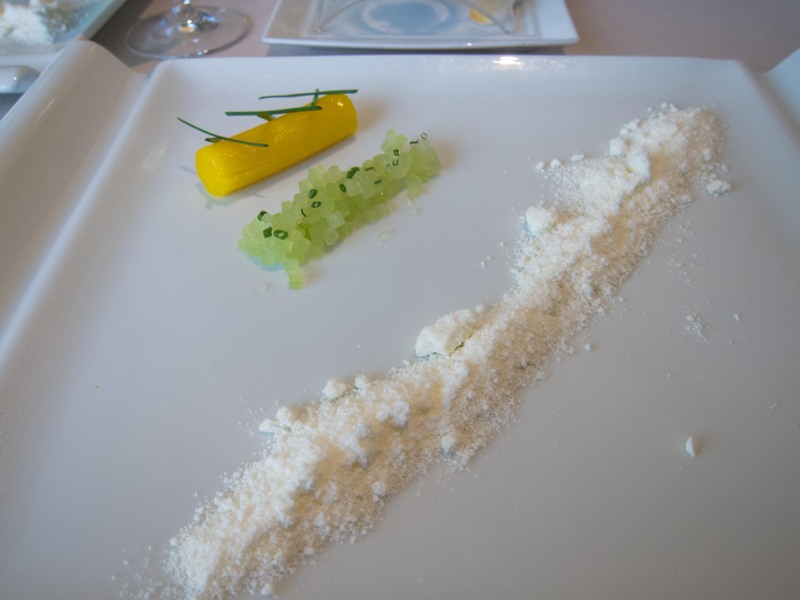 Cucumbers minced microscopic and some kind of tube of egg yolk custard complete the accompaniments. 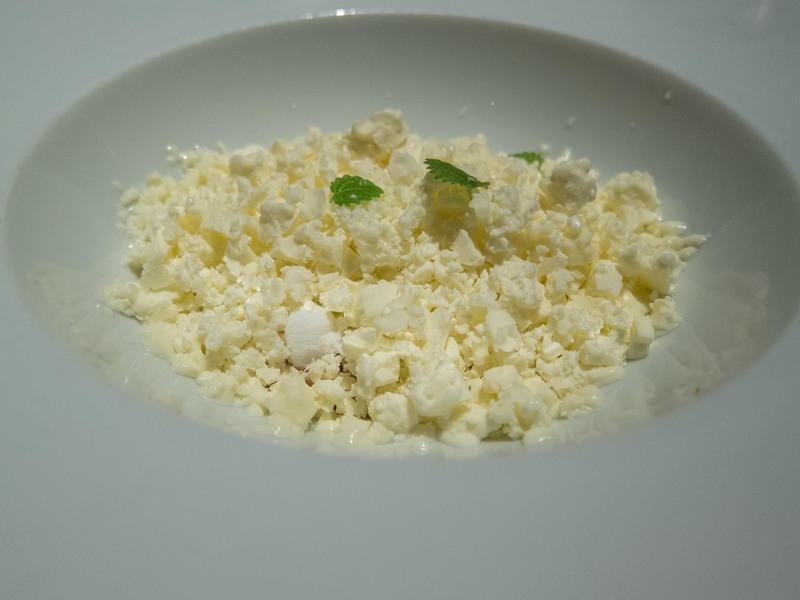 That line of white powder is really creme fraiche, flash frozen with liquid nitrogen. When you are having a lot of courses, each one can be very small. This “parfait” had three or four layers of goodness inside a cup that held perhaps an ounce and a half. I wish I could remember what was in it; I do remember that the little balls on top were very crunchy and added a level of texture to the dish. The inevitable foie gras, another work of art. Only two more weeks to enjoy foie gras here in California, so of course it was on the menu. Cyrus is offering “Humane” foie gras, grown by loving hands in a secret location in the central valley. They claim the ducks line up for their force feeding. Somehow I was picturing a facility full of kindly, aproned Jewish mothers saying ‘fress, kindela” as the livers grew and grew. In any event, the dish was wonderful. 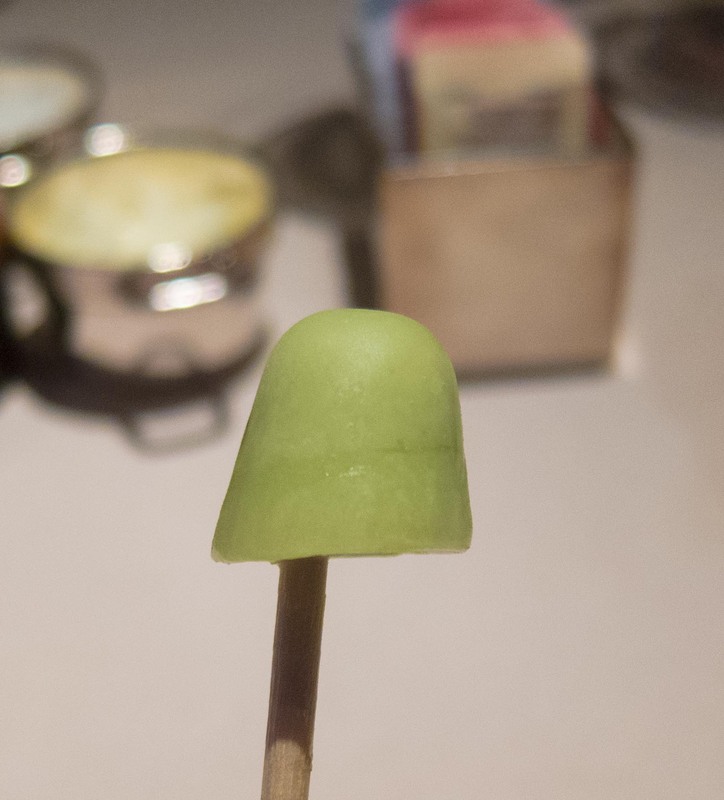 A fingertip sized popsicle of avocado and lime as a palate cleanser. 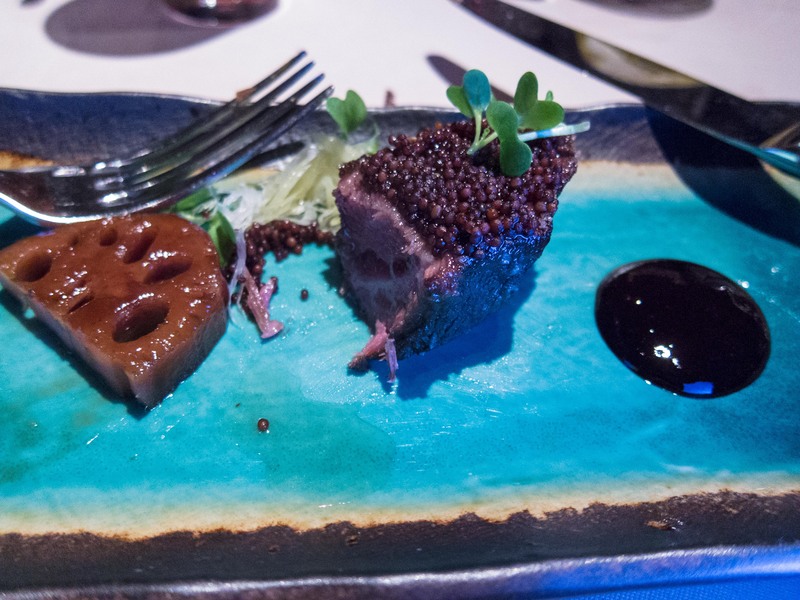 Seared beef cheek with green and black garlic, lotus root and natural jelly. I don’t know who first thought that cooking just he cheeks from a cow was a good idea, but he’s my kind of guy. This dish was simply superb; the meat falling-apart tender and tastier than a filet. It was hard to photograph because there wasn’t enough light on the sides, so I enlisted Mike’s help–having a top professional director as your lighting assistant seriously improves your photography. And his iPhone makes a great little accent light. 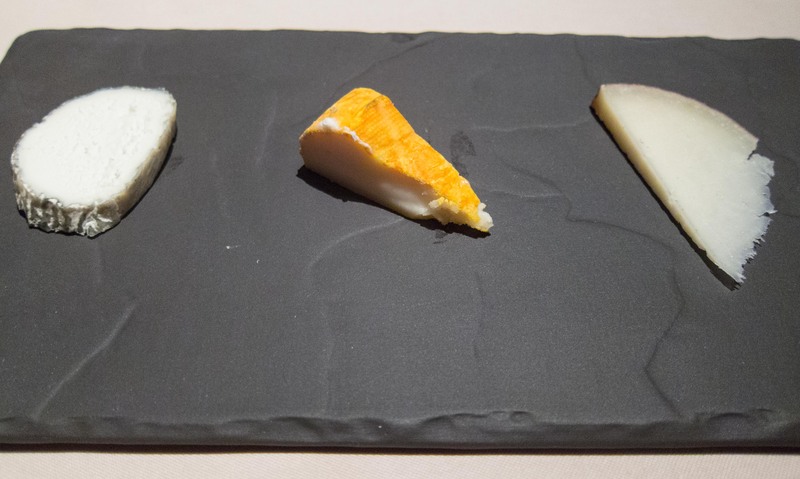 You get your choice of a variety of cheeses: this is the goat’s milk selection. I even had a glass of wine with this–a 1985 Toro Alba PX, which is very dark red and tastes like you just squeezed a handful of raisins until you got juice. The waiter kept explaining that it is really a white wine, but that just goes over my head. If it looks red, it is red as far as I’m concerned. Yuzu crémeux, bergamot meringue and cream cheese ice cream. One of my desserts. This is indeed ice cream, again frozen with liquid nitrogen so it looks all granular and then melts quickly to the normal consistency. The other dessert disappeared too fast to take a picture: goat milk panna cotta with rhubarb, parsley lime ice. I was the only one who got that, so I passed it around the table. It made two complete circles and was gone. Gail, who isn’t much of a dessert eater, wanted another but decided to be mature. The dessert the others had. I noticed no leftovers. There was more, but this is already the longest blog post in history. Sweet Corn and truffle Risotto. Chorizo crusted Scallop with sweet corn and lobster froth. Halibut with pea sprouts and asparagus, lemon verbena. Spring lamb tataki hot pot. Wines for every course. Over 1200 wines in the wine list, and a sommelier who seems to know every one, the winery it came from and what side of the hill the grapes grew on. The service is magnificent; always helpful without being intrusive or obsequious, willing and able to answer my endless questions about rare ingredients and technical cooking methods, completely professional at all times. 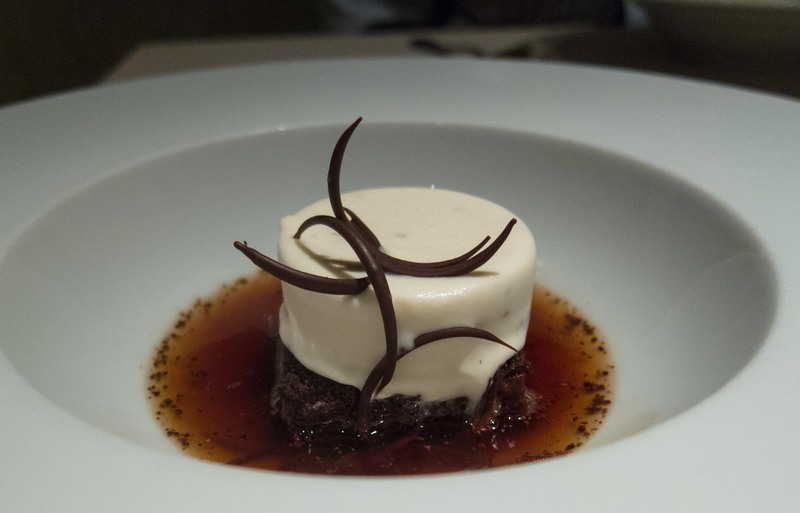 Critics will always vary and every year they crown another “best restaurant” in the world. 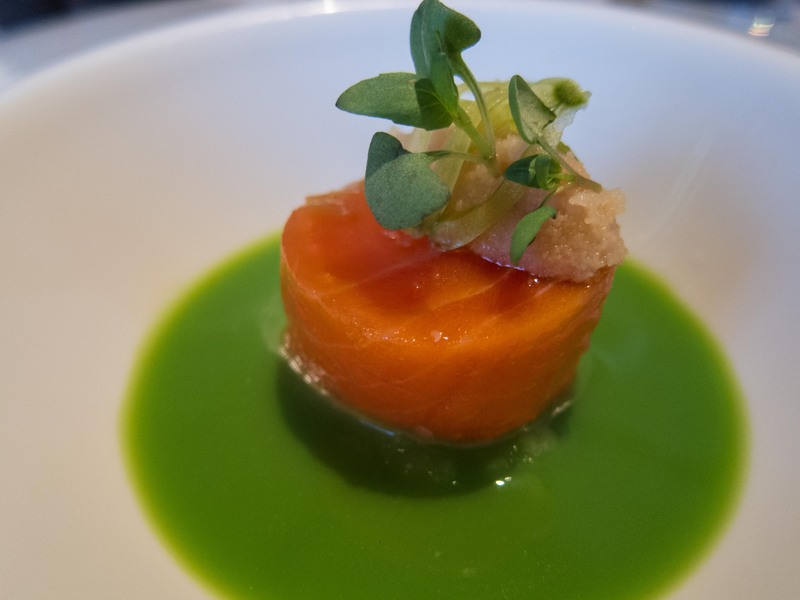 I’ve had the good fortune to eat at Cyrus twice, and it would be very hard to be better than they are at any part of the experience. 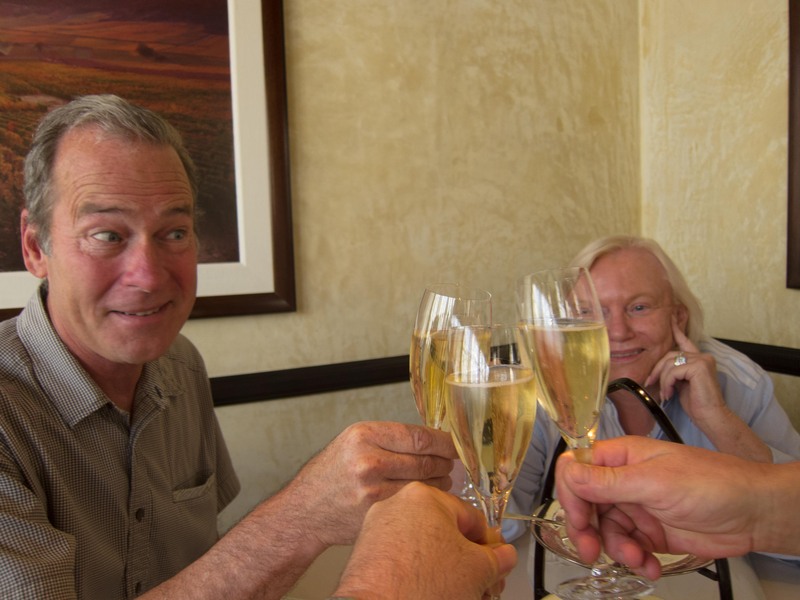 It was a wonderful, fantastic night and I recommend you find a special occasion, make a reservation a month or two in advance and go on up to Healdsburg for the meal of your life. I always enjoy sharing your meals vicariously–wonder why I’m not getting any thinner? Tried to get reservations in October or November. No luck. But on a whim checked Open Table for this weekend, while I’m directing the Sonoma Sectional. BINGO. I’ll be dining there on Friday night. Starting later this week, foie gras will be openly — and apparently legally — available at one San Francisco restaurant. Along with nearby newly opened Dixie, Presidio Social Club is located in the Presidio, which is federal land and according to the restaurant, hence exempt from the California foie gras ban. As of Saturday July 14, Presidio Social Club will begin to take advantage of its location and do what most other restaurants cannot do at this point: It will introduce foie gras as a menu staple, offering a foie gras slider indefinitely. They’re also including foie gras as a supplement in their Bastille Day prix fixe menu all weekend. Get ready for those protesters? What: As a result of being on federal land, the Presidio Social Club (PSC) is exempt from the state-wide ban on heavenly Foie Gras. Therefore, PSC will be celebrating two important independences this July: Bastille Day for the French, and the freedom to enjoy Foie Gras for Californians. Beginning at 4 p.m. on Bastille Day, PSC will continually feature Foie Gras as a staple on its menu. The star of the show is an American twist on a French tradition: a Foie Gras Slider on a house-made, toasted Brioche bun paired with a PSC style Sauternes Cocktail for $20. Celebrating French independence, Presidio Social Club will be serving a complete dinner-for-two including a bottle of Chateau Dom. Du Dragon Grenache Rosé. The meal includes a Butter Lettuce Salad with champagne vinaigrette and fine herbs, Wood Oven Roasted Cotes du Boeuf with frites, and Profiteroles to finish. This prix fixe meal is available on July 14 and 15, 2012, starting at 5 p.m. for $48 per person. Guests may add seared Foie Gras for $18. Will this start a pattern for other restaurants located on federal land, like the Cliff House, Murray Circle, the aforementioned Dixie, and so on? Will there soon be foie gras at the Presidio bowling alley? Stay tuned. Wow, nice luck. Enjoy your meal Friday. I’m glad to hear of somewhere to eat foie gras. Hope the California ban doesn’t last long, it’s awfully silly.